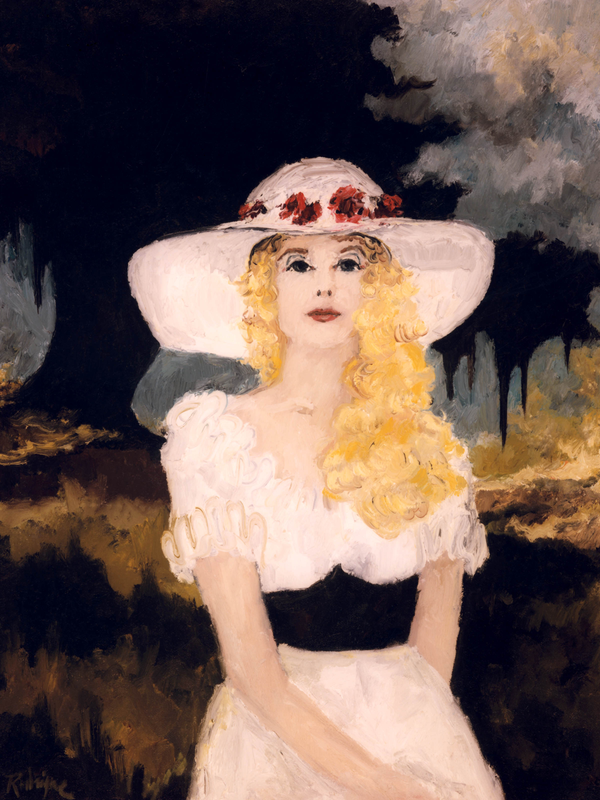 By the mid-1970s George Rodrigue painted on average forty canvases per year, all scenes of Cajun folk-life stemming from his first painting with people, Aioli Dinner (1971), while incorporating the distinctive oak trees from his landscapes. 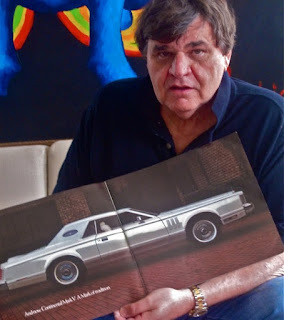 Although he rented a gallery in Lafayette, Louisiana, he sold most of his work on the road in Houston, Dallas, Birmingham and other cities, usually from the trunk of his car to collectors he met on referral from restaurants, banks and jewelry stores. Following the birth of his son André in 1975, George longed for new clients without the road trips. 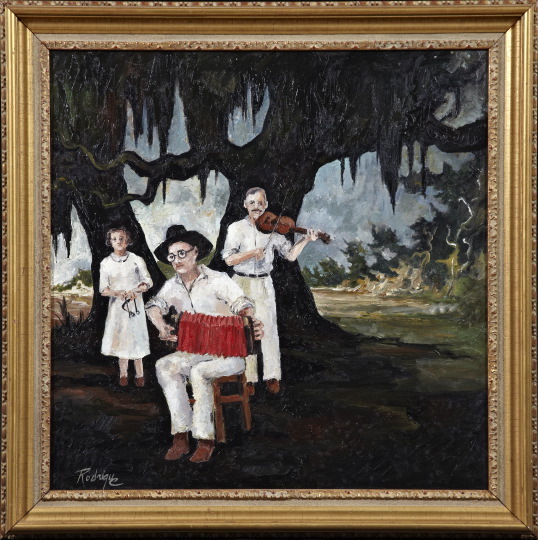 He sought gallery representation, but options were few in those years, especially in the South, and his efforts in New Orleans, with the exception of a short stint at the Reilly Gallery, proved unsuccessful. Out of nowhere, opportunity knocked. Oxmoor House, publisher of Southern Living Magazine, approached George about a book. 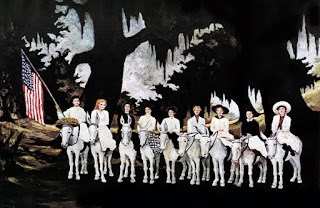 Based in Birmingham, Alabama, they knew his paintings and envisioned the work in a large coffee table-type format, linking it to their 1974 publication, Jericho: The South Beheld, by James Dickey and Hubert Shuptrine, a book hailed as a southern publishing phenomenon. Despite the obstacles, George jumped at the chance. According to his contract, he would write the text, provide transparencies of his artwork, and commit to $75,000 in book purchases. 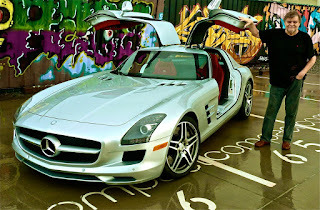 He learned quickly that books, especially art books, rarely generate profit for the author/artist. He also learned, however, that books sell paintings. He signed the contract late on the Friday afternoon of a holiday weekend. With $400 in the bank, he wrote a hot check to Oxmoor House and spent the weekend knocking on doors, paintings in hand. In three days, using his hometown connections, he made some of the money and borrowed most of it, covering the check. It was a long shot, typical of George, the type of challenge he relishes, no different than raising his Jefferson Street house to build a gallery underneath, purchasing a building adjacent to St. Louis Cathedral, or for that matter shifting from Cajuns to Blue Dogs. George wrote the book the following week, hiring a translator for the French text, printed alongside the English. The large format features more than one hundred paintings with George’s detailed descriptions. The Cajuns of George Rodrigue (1976) was the first book published nationally on the Cajun culture and the first bilingual American book ever printed. The book caught the eye of the Director of the National Endowment for the Arts who showed it to First Lady Rosalynn Carter. Mrs. Carter chose the book as an official White House Gift of State during President Carter’s administration. 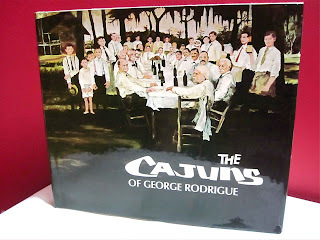 The Cajuns of George Rodrigue also made the Top 10 Best Southern Book List of 1976. George was ecstatic. The Cajuns’ accolades elevated his resume. But the $75,000 presented a problem. At the time his paintings sold on average for between $500 and $5000, and the short-term sales couldn’t possibly cover his debt. He devised a plan. In exchange for his investment, Oxmoor House sent George his share of the books. However, selling them was difficult. 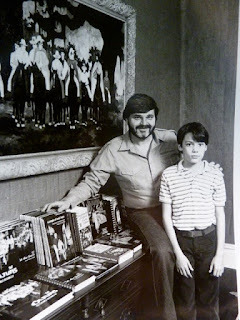 In pre-internet 1976 only six bookstores existed in the state of Louisiana. And think about this ---- 2,500 large-scale hardcover books weighing four pounds each, delivered to his house on wooden pallets by a semi-truck. It was daunting. However, George Rodrigue is creative in all things, and he relished this challenge. He secured a mailing list for every French teacher in the United States and offered The Cajuns at $15, discounted from the $24.95 list price. He recruited friends to package the books and process the payments. Within days, the orders poured in. Simultaneously, area banks sold the books alongside their teller windows, offering a special price for customers opening new checking accounts. Within two months George repaid his loans. Within six months he felt the book’s long-term effect on his painting sales as it impressed potential buyers. He broke his own sales records and, unable to meet demand, raised prices. In addition, as a direct result of The Cajuns, George painted in 1976 a gift from the State of Louisiana to the President of France, Valéry Giscard d’Estaing, increasing Rodrigue’s reputation internationally, especially on the heels of his Paris Le Salon award of 1974 (story here). Most important, The Cajuns of George Rodrigue taught the artist the power of publishing. It was books that would sell his paintings; it was books that would make him famous. The story about the French teachers is the most compelling tale ever to come before this reader's wide eyes. George would have made it on merit, yes, but who knew someone so right-brained could be such a sly marketer? !